* Stop #1 of my Burger Love adventure. 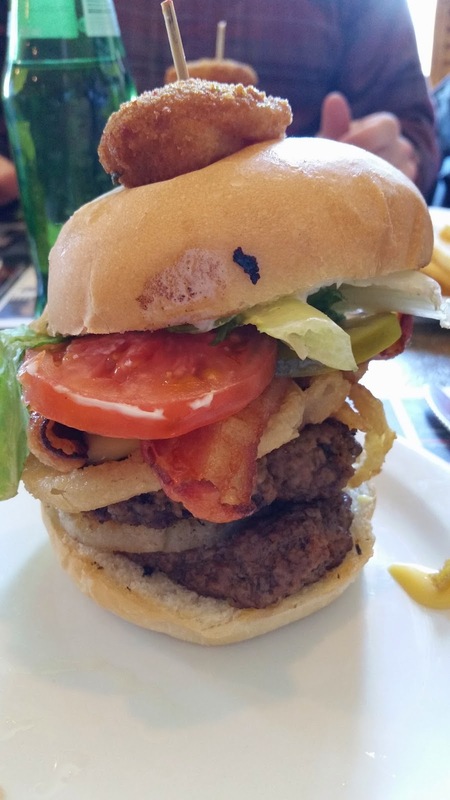 The first burger I tried this year was the "GJ's Bad Boy" from Gentleman Jim's in Summerside. The burger consisted of two 5oz. Island Beef patties with Michael's Special Seasoning, Mustard, Fresh Pineapple Ring, Onion Chips, Iceberg Lettuce, Two strips of Bacon, Tomato, Dill Pickle Slices, Jalapeno Cheese Sauce, and Mayo on a Grilled Bun topped with a Jalapeno Popper. First off it's a big sandwich, the two patties make for a solid meal. As someone who doesn't normally eat spicy food I wasn't sure of this one going in but the jalapeno sauce wasn't very spicy, which was a good thing for me. The burgers were cooked well and the flavour of the burger, bacon, onion chips and cheese sauce went well together. As I mentioned in my original Burger Love post I am a little picky so I removed the pineapple, pickles, tomato and the jalapeno popper from this burger. Overall the burger was good but nothing fancy. There was a bit too much sauce for my liking and quite a few ingredients that I picked off the burger but overall not a bad start to my burger love quest.